"He would even groom them while they were asleep." Ron the kitten was rescued from a feral cat colony in Colorado when he was just 3 months old. He was rescued along with his three siblings, Harry, Hermione and Luna. 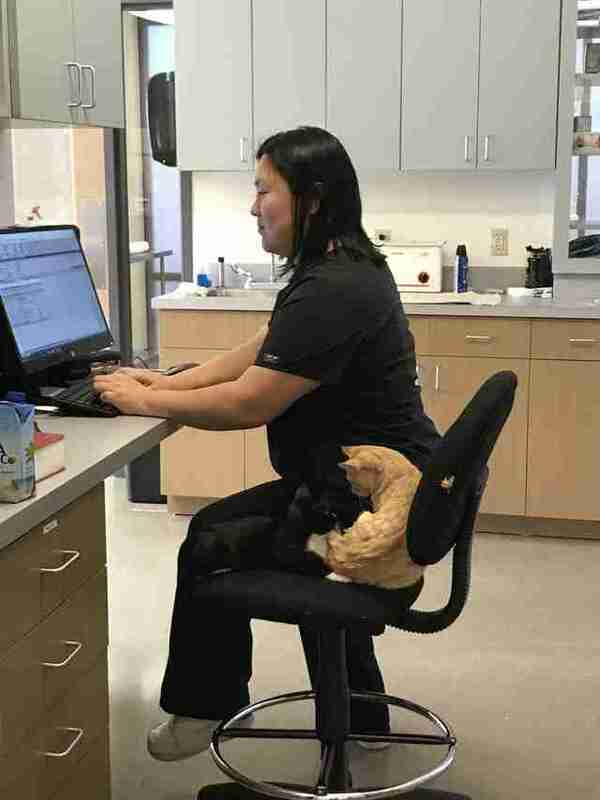 When he first arrived at the Northfield Veterinary Hospital, he was so scared that he refused to come out of hiding - but it wasn't long before he became the hospital therapy cat. Once Ron warmed up to his new temporary home, he started showing a huge interest in getting to know all of the other animals who came through the hospital. 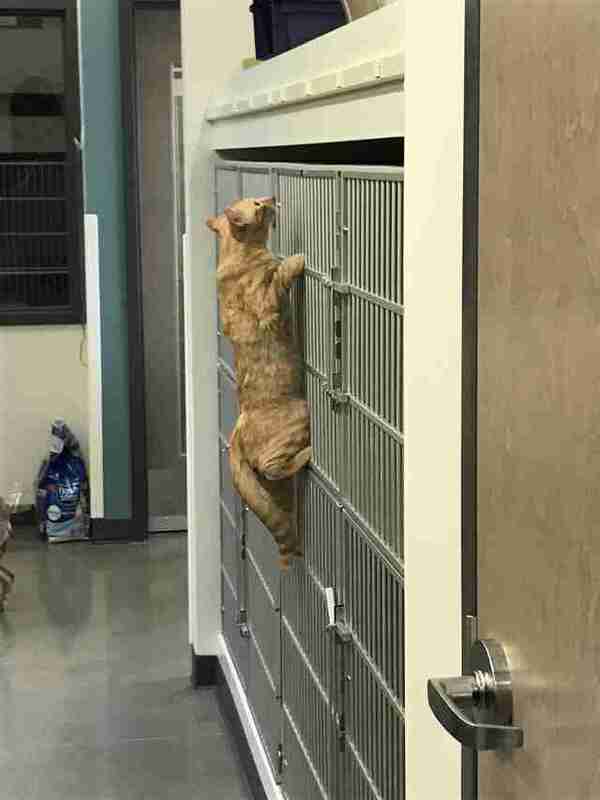 He wasn't scared anymore, and it was as if he wanted to show all the other cats and dogs that they didn't have to be scared, either. 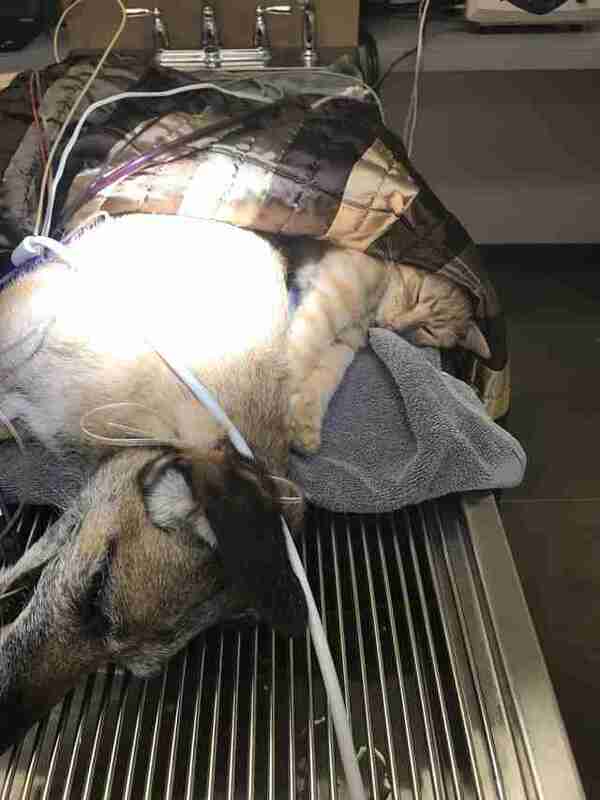 "He would approach any other dog and cat without fear, and would try to climb into their cages or join them up on the table if they were getting vaccines," Shelly Sandel, veterinarian and co-owner of Northfield Veterinary Hospital, told The Dodo. ... and the staff too, of course. 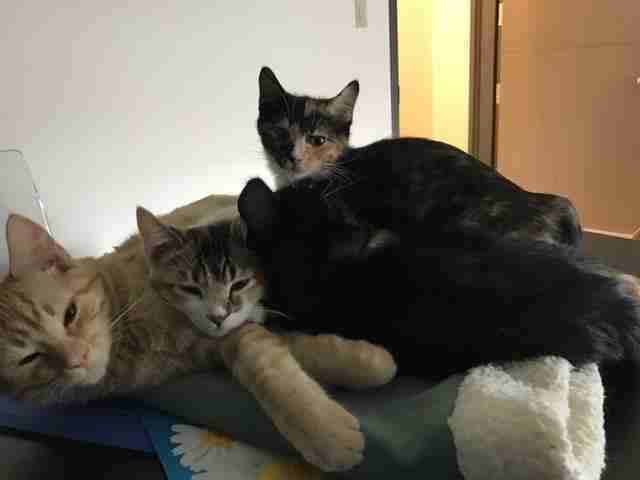 Besides greeting and getting to know all of the animals, Ron also started keeping them company while they were having procedures done, snuggling up to them so that they would know they weren't alone. 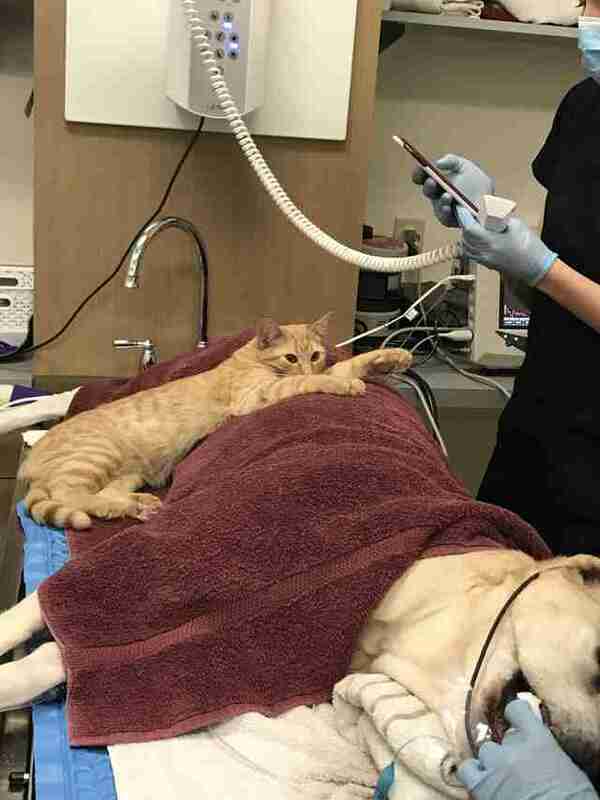 "He started to cuddle up to any pet who was under anesthesia for dental work (not sterile procedures) and provide them with body heat," Sandel said. "He would even groom them while they were asleep, seemingly trying to provide them with comfort." 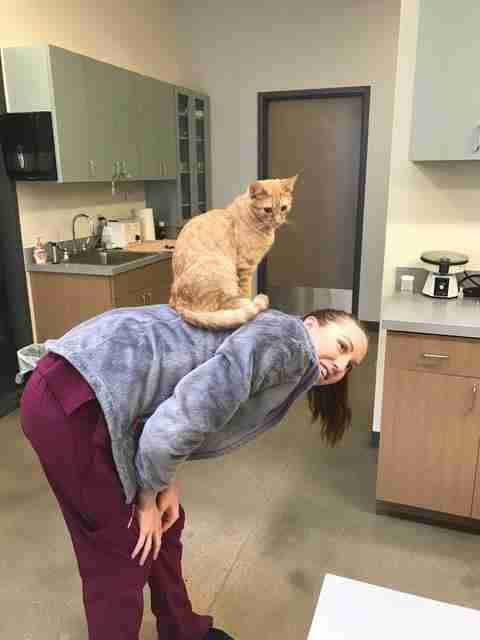 The staff at the hospital were so smitten with Ron and his adorable antics that they started posting about him on their Facebook page - and before long, people started requesting his "services" for their pets who were scheduled to come into the hospital. Ron seemed to have a strong sense for when an animal really needed his comfort, even when the staff couldn't sense it themselves. 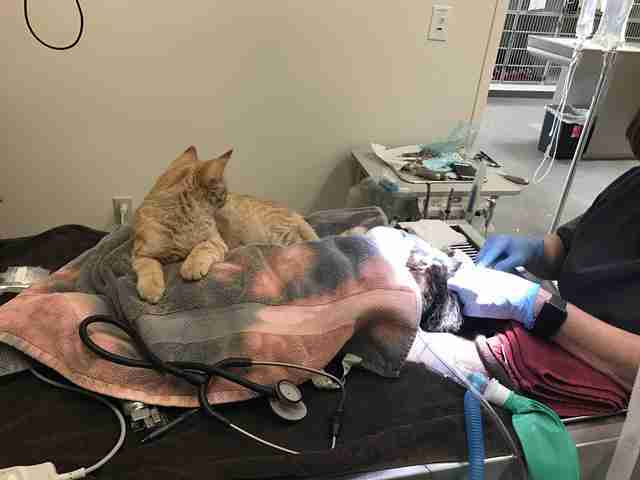 "We once had a very aggressive kitty come into our hospital and the owner warned us that it would be almost impossible to examine him due to his temperament," Sandel said. 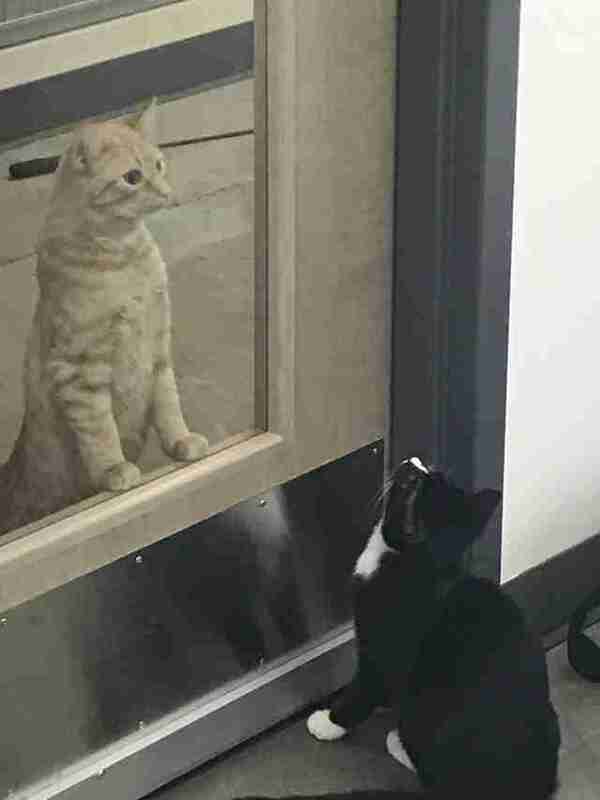 "We usually had Ron locked up around aggressive kitties, but he escaped from his hold and ran up to this very frightened kitty and they became friends - touching each other and grooming each other. And the 'aggressive' kitty was fine after that and let us examine him." Ron was quite the little miracle worker, and the staff and patients alike absolutely adored having him around. But after about three and a half months, it was finally time for Ron to head off to live with his forever family, who, as it turned out, needed his comfort just as much as the patients at the hospital did. "He lives with a family who has a young child and an older dog, and needless to say, they all love Ron," Sandel said. "The older dog is usually a bit cranky around other animals, and even she will cuddle with Ron." It seems that Ron was born to help others in need, and now he has a forever family that he can brighten the lives of every single day. "He is the most outgoing, fearless, happiest cat I've ever been around, and he's still just a kitten," Sandel said. "We miss him very much, but we're so excited that he has found such an amazing family to take care of him."